Martha Berry says that Mr. Macy was a best friend, and sends the students, faculty and her own sympathy. In this letter Mrs. McCready donates one dollar in response to an appeal letter. Martha Berry thanks Mrs. Cross for her gift and passes along her sympathies. 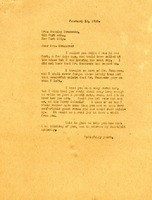 Martha Berry reaches out to one of her friends. 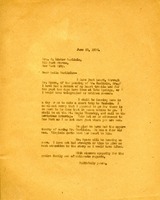 Berry writes to Carlisle to express her sympathy for his family after his father's death. She also thanks him for lending Mr. Byers and for all his kindnesses. 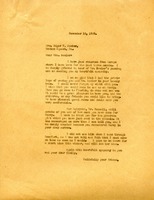 Mr. Barrow writes to Martha Berry, saying that it has been a hard year for all the world. He hopes that the suffering will bring everyone closer together. He encloses $2 of sympathy for Miss Berry. Miss Berry expresses her sympathy for Mrs. Seeler on the death of her husband. She thanks Mrs. Seeler for her generous gift and invites her to visit as soon as she can. 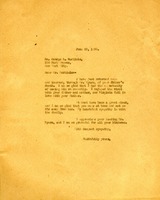 Miss Berry expresses her sympathy to Miss Seeler and asks her to visit the schools soon. She also asks Miss Seeler to look up her nephew who is studying in New York.